to build support for the program. I did a power of painting there. at the opening. Do come. Still, the agency can’t be too displeased. They’re sponsoring my touring show. That’s coming up next spring. Would I go back? Don’t know. when I should have been painting. But Jupiter would be worth the trip! those moons, each one’s so different. 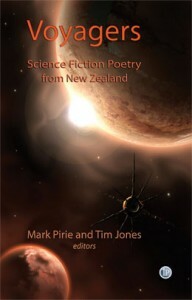 Tim Jones is a fellow Tuesday Poem poet, as well as an editor and writer of speculative, literary and interstitial fiction. In addition to The All Black’s Kitchen Garden, his short story collection, Transported, was published by Vintage in 2008 and longlisted for the 2008 Frank O’Connor International Short Story Award. He is also the co-editor, with Mark Pirie, of Voyagers: Science Fiction Poetry from New Zealand (Interactive Publications, 2009). I initially encountered “The First Artist on Mars” in Voyagers and felt that the invention of Tim’s “rather conceited artist” was an excellent one—and yet the feeling for Mars as place still came through. This thread to the poem, of course, fits with yesterday’s second instalment of my “Influences on Story” post series, in which the influence I looked at was landscape, in reality and on the imagination. If you check out the post, you’ll see that there’s also an opportunity, as writers, to comment on whether there are landscapes that have strongly influenced your work. Or you can comment as a reader re landscapes in fiction that you have either particularly enjoyed (as I enjoyed Mars in this poem) or felt shaped a work. So do feel free, poets and poetry readers, to take a look and participate! To read more Tuesday Poems go to the main site (or click on the Quill icon in the sidebar). but limited you know” are the perfect way to close this poem. Your conceited artist displays a certain naivete here, Tim?! This is a terrific piece. It makes me smile – and I agree with Helen re; the person and the planet. We get to meet them both in this strange, brief encounter. Thanks. Helen – influential landscapes for my writing include Antarctica (esp. The Bay of Sails and the Taylor Dry Valleys), the salt mine just beyond Kaikoura (en-route to Picton), the veld surrounding my childhood home in S. Africa and the waterways of Venice. 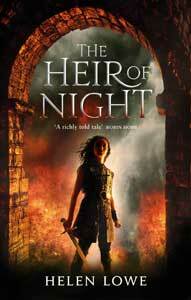 Congrats to you for “The Heir of Night.” The cover is certainly dramatic and alluring! Claire, I agree with you about the poem—there’s another Tim poem immediately preceding it, Touchdown, also about Mars that is more realistic, but I just loved the humorous interplay in this one. Hi Helen, am emailing you and looking at your site simultaneously; nice poem by Tim. Makes me laugh and wonder. Thanks. Thanks, Helen and Claire! As long as there’s a decent gym on board, my artist friend will be off on one of the first starships out of our solar system, which is, after all, rather provincial in galactic terms. The landscaper of Mars is definitely the winner here and Tim has managed to make it so with just one or two lines … very clever.